Outside Paddy’s Markets today I noticed these signs to forewarn you. Prepare for the arrival of wheelchairs and strollers (stage left). 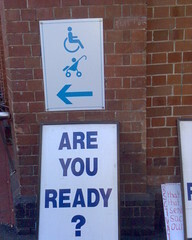 This entry was posted in Humor, Photos and tagged photo, sign, stroller, wheelchair. Bookmark the permalink.